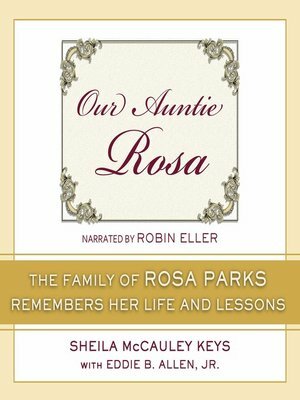 In this most intimate portrait yet of a great American hero, 'the lady who wouldn't give up her seat on the bus,' the family of Rosa Parks describes the woman who was not only the mother of the civil rights movement, but a nurturing mother figure to them as well. Her brave act on a bus in Montgomery, Alabama, on December 1, 1955, was just one moment in a life lived with great humility and decency. In Our Auntie Rosa, Mrs. Parks's loved ones share their remembrances and reflections to create a previously unpainted picture of the real woman behind the legend. Rose Parks largely disappeared from the public when she and her husband, Raymond, relocated to Detroit in 1957, escaping violently racist south. It was in Detroit where Mrs. Parks reconnected with her only sibling, Sylvester McCauley, whom she affectionately called 'Brother,' and her thirteen nieces and nephews. Years later, after Raymond's and Sylvester's deaths, these children would become her only family, and the closest that she would ever experience to having biological sons and daughters. Mrs. Parks would go on to receive the 1996 Presidential Medal of Freedom and a spot on Time's list of the hundred most influential people of the twentieth century, as well as forty-three honorary doctorate degrees, and have dozens of city streets, community centers, and monuments named for her—to mention just a few tributes. Yet the woman her family knew as 'Auntie Rosa' was a soft-spoken person whom very few people actually knew. In this book, her family shares with readers what she shared with them about her experiences growing up in a racist South, her deep dedication to truth and justice, and the personal values she held closest to her heart.